This is a sponsored conversation written by Wrapped Up N U on behalf of Nail-Aid. Do you have a beauty guru on your holiday shopping list? The elves at Wrapped Up N U are thrilled to be spreading some holiday beauty joy with these budget-friendly, cruelty-free items from Nail-Aid that are available at a Walmart near you today. We submitted our holiday wish list to them and as you can see we have been very good this year! It's great to be able to pamper ourselves any time of the year but it does seem to be a little more stressful around the holidays. So, we can speak from experience that a beauty gift will be much appreciated. Plus the winter weather can wreak havoc on your skin and nails. Here is a list of our top suggestions from Nail-Aid. 1 MINUTE ARTIFICIALS - A powerful treatment with incredibly hard iron formula to make soft, weak nails look and feel like hard acrylics. 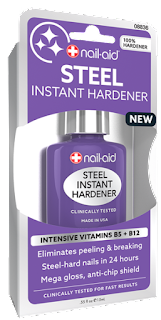 Added strengthening iron rebuilds dense layers for strongest nails. Instantly ends chipping & cracking. Makes nails thick, hard as acrylics without salon visits. High-shine manicures that last up to 2 weeks. Dries fast to a crack-proof finish. 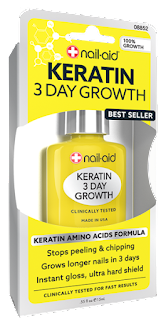 KERATIN 3 DAY GROWTH - Keratin is the hardening protein that builds nails. 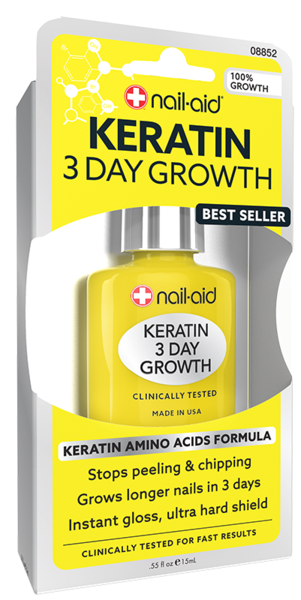 This powerful keratin amino acids treatment absorbs into soft, weak nail layers to give them maximum strength, stopping peeling and chipping. Dries quickly to an ultra hard finish. 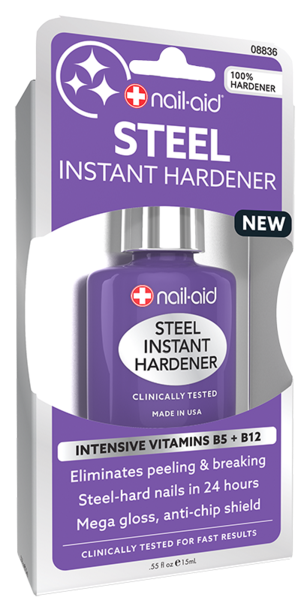 STEEL INSTANT HARDENER - A treatment packed with B-complex vitamins that are essential for healthy nail growth. Nail-building vitamin B5 helps build hard, unbreakable layers, while vitamin B12 works to eliminate peeling and breaking. Ultra glossy manicures that last longer than a week. Dries rapidly to an anti-chip shield. Innovation + Results - With a super unbreakable gel formula & nail hardening vitamin B5, this 3-in-1 combination of gel base + gel top coat + gel hardener protects color from chipping and provides shine as it reinforces soft, fragile nails. Base coat glues color to nails for a 14 day, chip-free gel wear. Top coat gives a thick gel-gloss finish. Hardener transforms soft, fragile nails to strongest, hard as salon gels. 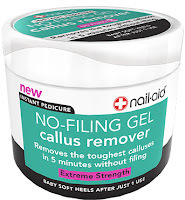 NO-FILING GEL CALLUS REMOVER - A powerful, fast-acting gel callus remover for file-free smoother heels. Removes cracked heels & toughest calluses in 5 minutes. No filing. No scrapes. No skin irritation. RETINOL + AHA EXFOLIATING FOOT GEL - An oil-free, hydrating foot gel with powerful retinol & AHA for intensive exfoliation on dry, cracked skin. Exfoliates dry, flaky, cracked skin on feet. Leaves feet smoother and softer, not oily. 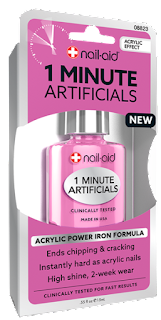 Nail-Aid’s SPRAY AWAY— the first-ever aerosol nail polish remover that provides fast and effortless nail color removal while hydrating nails, available exclusively in all 4500+ Walmart stores nationwide. 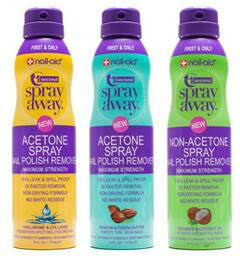 Unlike other removers that use water to dilute the harsh effects of acetone, Spray Away uses aerosol technology to marry acetone and other moisturizing ingredients such as keratin and collagen, which would not be possible with any other application (think oil and vinegar). Acetone is long to know to be most effective to remove polish, but now you could use it guilt-free without the repercussions on your nails! These are really nice, I definitely could use some new supplies in my nails. Oh, I could use some of these nail strengtheners. I used to have great nails but I guess age has started to affect them.